The sUAS rule for commercial operations is set to take effect August 29, 2016. The barriers to entry have been decreased significantly and opened the doors to businesses that want to leverage this technology. However, there are a couple of ways we can expand upon the rule that will allow our customers to expand their own operations. One of those opportunities is allowing the drone to fly beyond the visual line of sight of the operator. This would allow for drones to survey not just one field at a time but maybe survey an entire farm or at least an entire section at a time. This will provide much more efficiency to farmers and help keep the cost down of the drone operations. Under the Pathfinder program, PrecisionHawk is actively performing research operations with the FAA to explore extended visual line of sight (Watch more on Pathfinder testing here). What is wonderful about this is that the data we capture under the Pathfinder effort is going directly into the FAA’s hands every time they write regulation. Whether this is part 107, or further expansion in the future that might allow for things like beyond visual line of sight flight, our research is the foundation upon which they are making those decisions. To continue pushing the boundaries under Pathfinder, this week we received our experimental airworthiness certificate from the FAA, which means we can officially begin flying EVLOS (extended visual line of sight). 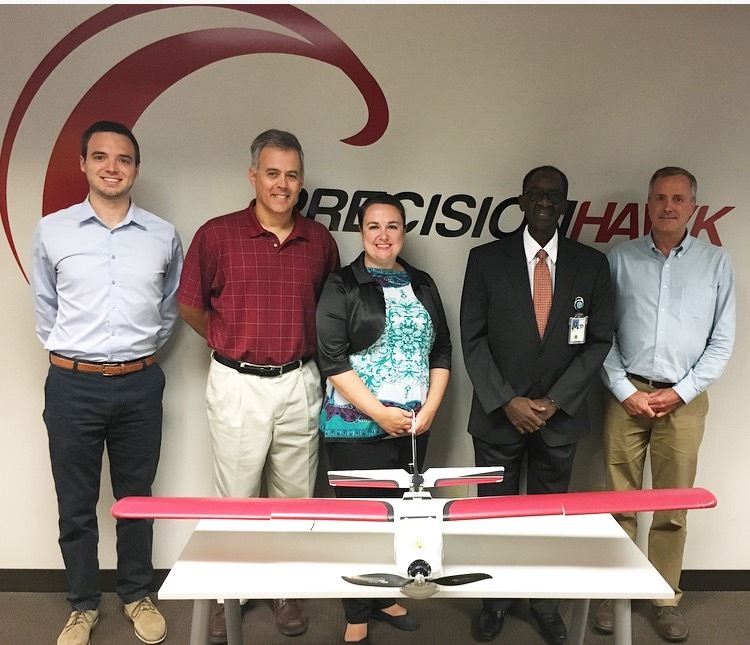 This is a major accomplishment for the team as PrecisionHawk fully committed to the certification process, which included demonstrating our aircraft and engineering procedures as well as showcasing that our training and pilot qualifications are in compliance with existing regulations. To understand how these new technologies change the risk profile, we need to understand what those changes look like on a large (nationwide) scale. Existing small-scale understanding of risk (provided by, for example, Pathfinder) can drive the creation of a concept of operations in the near term that will allow for safe data gathering on national level operations, directly address the primary use cases of precision agriculture and critical infrastructure surveillance and determine how we can do this now. When Part 107 goes into effect, we hope to have made a safety case that paves a path for those who want to perform operations that extend beyond the boundaries of the current rule. These efforts are all the spirit of growth, innovation and progress of the drone industry as a whole. The Pathfinder program opened up a regulatory pathway specifically to show under what conditions an exemption to the existing rule is possible. What kind of pilot training should be required? What kind of technology equipage or compliance is necessary? Specific to these potential requirements, we will continue testing the LATAS platform as a service to address safety by tracking and reporting UAS operations, providing awareness of ground and air obstacles and mitigating the overall risk surrounding drone operations. Next step is collecting as much data as possible through the end of 2016. Through PrecisionHawk’s collaboration with Kansas State University, we will be assessing a large group of pilots and non-pilots to understand the human factors and environmental pieces that go into safe EVLOS operations. We will perform ongoing experiments that assess a solo pilot as well as a remote visual observer (aka someone who is outside of the pilot’s viewable airspace) and work to deliver the FAA with a reliable safety case for drone operations that take place outside of a user’s line of sight. Stay Tuned! If you want more information on how your business can implement LATAS safety services, get in touch with us at info@precisionhawk.com.